Time for another interview! This time, I had the honor to interview Emre Kiris. Emre is an archivist and documentalist for Glycine Heritage. He has his own website, Glycintennial, with all the info on Glycine watches you need. He’s also active on several watch forums and he’s an avid book collector. I contacted him on Watchuseek in 2015 and we’ve stayed in contact since. I think watches in general is a boys thing. The fascination of tiny mechanical pieces working in harmony is alluring. Contemporary watches vs vintage watches is a choice. If you have an 18k beat timepiece from the 1940’s, it ticks like a watch. In my mind, they sound way better than modern watches because of different case constructions. I think it was when I re-discovered one of my childhood mechanical watches in the attic that the love for vintage watches started. The whole obsession resurfaced, like long suppressed emotions. The following week, I’d already bought a couple new old watches. My collecting phases were very much related to my learning path. When I started, I bought everything I liked. I ended up with nearly 100 watches in the first year. Many mistakes were also made. I bought some homemade “franken watches”, converted watches and re-dials. I guess all beginners make similar mistakes and the path of attraction is similar. Unfortunately there are suppliers to feed the uneducated beginner so all those lessons cost you something. It was after the first year that I understood which direction I would like to go with my collection. I started to sell many watches to develop a vertical collection which was brand oriented. In my fifth year I had the largest vintage Glycine watches collection. That’s also when I built my website. Now, after 8 years of collecting I still have a large inventory of Glycine branded vintage watches even though I donated most of the premium and rare pieces to the Glycine Heritage museum. Unintentionally, I developed some sub collections of vintage chronographs, a complete range of early and weird automatic timepieces, and interesting complications like dead beat seconds. I have a good rotation of watches that I’m wearing. The watches that I wear the most are a Glycine Airman from 1958, an Angelus Chronodato from 1952 and my birth-year Rolex Submariner from 1979. I want to own one of those decimal pocket watches which were manufactured back in the French Revolution era. The estimated production volume was 20,000 back in 1790s. Even though they are still around, they are not easy to find in a decent condition in an acceptable price range. So, I’m waiting for the right time. I think I’d buy more watches! The vintage watches market has no more supply but demand is increasing. When I started, I could easily buy premium pieces in the 200-300 Euro range. Now, the same watches are 1,000+ Euro. I’d buy more chronographs and also more ‘80s retro pieces. They are skyrocketing nowadays. Huh, that’s a tough call! To name a brand. I believe that the more information is revealed the more demand it creates. There are some relatively unknown decades of the previous century as far as wristwatches are concerned. For example, the ‘20s and ‘30s are not well documented and thanks to enthusiastic researchers we slowly get to know more. You never know what will resurface from those times, so it’s unpredictable. There are also many brands that are under the radar. Everyone keeps buying similar branded watches and then it becomes a trend. Many vintage brands are also being resurrected now with new investors, so their new positioning is also affecting their vintage pieces. Some are coherent, some are up-lifted, some downgraded (think of modern Invicta vs vintage, modern A. Lange & Söhne vs vintage). I believe Longines is a great brand to collect. Not only do they have premium timepieces, their heritage department is also very supportive. 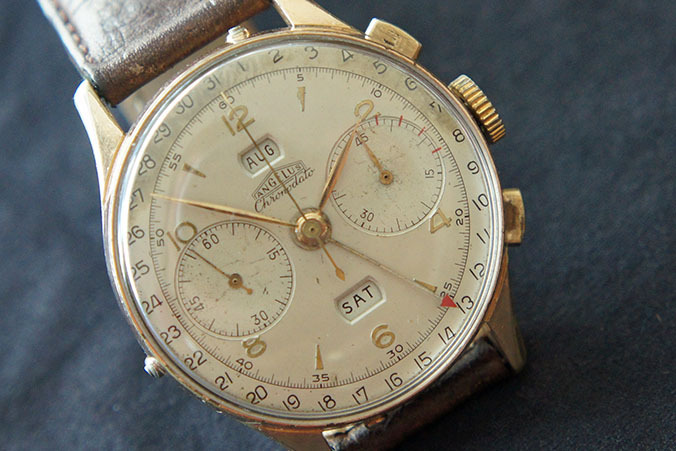 Free archive information on vintage timepieces is added value. We had advice too but generally followed our own path to learn from our own failures. It’s the journey, not the destination that matters. The only thing I’d suggest to beginners is to read a lot before you pull the trigger on a purchase. It will save you a lot of money and hassle. Also, remember that this hobby brings very authentic people together. Enjoy the company and the collector circles. Spread it to life and consider this hobby a lifelong fascination. Look at things from a broader perspective.